Glimmerglass is a world-class opera company situated on scenic grounds in Cooperstown, New York. The company stages four main stage productions each summer in an acoustically remarkable theater. With its home in Cooperstown, Glimmerglass was poised to become a travel destination. Situated on Ostego Lake, visitors can enjoy picnicking, relaxing before a show or strolling around the water or wooded areas. Glimmerglass’ beautiful scenery, emotionally moving performances and laid back atmosphere truly make it a place unlike any other. At Glimmerglass, arts, music, culture and nature come together to create a one-of-a-kind experience. Despite its proximity to a summer weekend destination, and its acclaimed opera performances, Glimmerglass was lacking awareness and was suffering from a declining, aging audience. Upon recognizing the problems, Glimmerglass partnered with Wanderlust to leverage its world-class product, bring in a younger audience and position it as a summer long festival not to be missed. Wanderlust began the rebranding process by suggesting a name change from “Glimmerglass Opera” to “Glimmerglass Festival.” This change communicates a “summer experience” unique to Glimmerglass, while opening the door for new audiences and opportunities to expand their offerings besides opera. Events such as backstage tours, guest speakers, concerts, meals with artists, post-performance Q&A sessions, children’s shows and getaway weekends were incorporated into the offerings. Collaborations with other Cooperstown attractions such as the Baseball Hall of Fame, the Farmer’s Museum, the Fenimore Museum and Historic Hyde Hall round out the Glimmerglass Festival experience. Wanderlust then used primary research to craft the new brand. Content development helped forage an emotional connection with potential customers by telling the Glimmerglass story rich in vivid mental imagery of a magical, yet laid back atmosphere. Four palette colors are used to represent the four main stage shows of each season and are symbolic of the summer light shimmering off of Ostego Lake. A modern, sans serif font compliments the new color palette by bringing a fresh and celebratory look and feel to the brand, appealing to younger audiences but not excluding Glimmerglass’ current customer base. A tagline, “Where the world stops to listen,” amplifies the Glimmerglass brand and positions the festival as a remarkable, world-class place unlike any other. The new brand was launched through a new website redesign and collateral program. 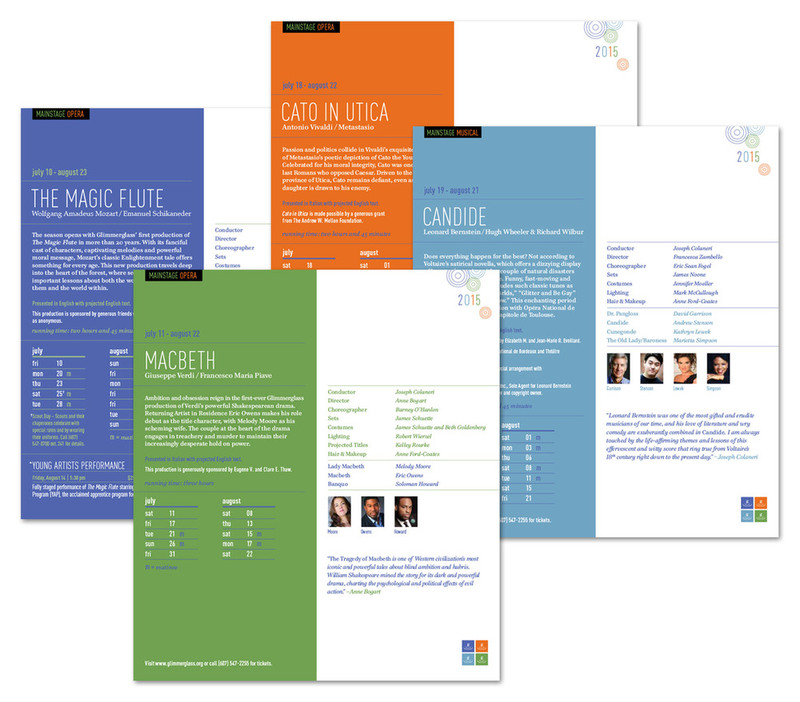 Using the new brand colors, a reworking of their old logo into a modern quadrant and fresh typography throughout, the season anchor brochure informs guests of the breadth of events that take place during the annual Glimmerglass Festival. The brochure also includes singular photographs depicting emotionally powerful moments from the previous year’s main stage shows, forging an emotional connection with potential festival goers. The website design utilizes the new look and feel and incorporates a simplified navigation with conversion maximizing calls to action. Wanderlust promoted special events, backstage sneak peeks, and special weekends, positioning Glimmerglass as a destination experience. Print publications were streamlined to feature only a few necessary and key documents, including the anchor brochure, festival guide and calendar, pocket calendar, renewal subscription and group sales materials. Pairing down the amount of print materials not only made the festival shows and events easier to follow for guests, but also cuts print and mailing costs. Each year, Wanderlust refreshes the various print publications and website to accompany the new season, in addition to assisting with strategic communications marketing. Wanderlust uses online and digital tactics to promote Glimmerglass. including SEM, display, Facebook NewsFeed, video pre-roll, radio and cinema advertising to market the festival. Click-through rates for such campaigns are solid; PBS video stands out with a 4.79% CTR in 2014, above the national average of 4%. Paid search ads for the main stage shows also perform particularly well, with CTR’s as high as 12.39% CTR in 2014, well above the national average of 2%-5%. Wanderlust creates Glimmerglass' e-mail marketing campaign, including an editorial calendar and content creation. Although updates are made from year to year to accommodate new marketing communications channels, the brand continues to be relevant and true to the overall positioning: Glimmerglass is a place unlike any other, where songs sparkle like sun on water, the stars shine bright, and the world stops to listen. Historic Deerfield Village isn’t a gift shop museum with faux architecture and replicated scenery. It is an authentic and well-preserved, 18th-century, ten-home village in the heart of central Massachusetts. Visitors stroll from one end of the street to the other, observing rolling farmland, beautiful New England foliage and historic homes unique to Revolution-Era America. 18th century decor and artifacts fill the homes representing period crafts such as woodworking, sewing and antique pottery, making the village an educational and hands-on attraction for families, collectors and history lovers. The challenge with this hidden gem was just that: it was hidden. Although this little piece of history remains beautiful and preserved, it was lacking public awareness of its many events, activities and exhibits. Operations and navigability of the village also posed a challenge, as once people arrived, they were unaware of the many historical treasures within each of the ten buildings and within the Flint Museum, a more traditional style museum with cycling collections and exhibits. Historic Deerfield Village partnered with Wanderlust to help solve these problems through building awareness, streamlining attraction promotions, implementing tour packages and creating a sense of place for visitors. A responsive website redesign reflects the new look and feel of the brand and acts as a hub for visitors to learn about all that Historic Deerfield has to offer. A nine-pane window navigation, reminiscent of period architecture, visually inspires website visitors to the main attractions while a standard navigation creates calls to action such as plan a visit, view upcoming events and submit an online donation. Videos help visitors visualize the authenticity of the village, and what it’s like to be there while highlighting demonstrations and workshops. To drive traffic to the site, Wanderlust implemented SEO, search ads and banner ads on NPR and PBS stations to appeal to different interests, such as antique pottery, period clothing or open hearth cooking. Wanderlust created custom tours of Historic Deerfield using color-coded keys to guide visitors through the village. Each of these nine tours offers a unique perspective of the historic homes and are tailored to historians, families and casual tourists alike to provide a sense of place. After the proprietary branding process, Wanderlust continues to help Historic Deerfield implement new attendance-boosting promotions such as Thanksgiving, winter and children’s events to attract visitors year round and make them aware of activities, events and exhibitions. The campaigns are executed online through display, SEM, Facebook, video and retargeting ads. Year over year the campaign drives amazing results. In particular, video ads in 2014 drove click through rates of 7.13%, well above the national average of 4%. Wanderlusts’ work with Historic Deerfield helped the organization reach their initial goal of increasing ticket sales and memberships by 20%. Rebranding efforts, content development, a new website and strategic online advertising campaigns have also positioned the organization as an easily navigable, authentic, “back-in-time” experience for people of all ages. The Chickasaw Nation is the thirteenth largest federally-recognized native American tribe in the United States. The tribe enjoys a thriving, vibrant culture rooted in its rich heritage. Their 7,600 square mile territory in south-central Oklahoma features many recreational and tourism attractions, highlighted by the new Chickasaw Cultural Center in Sulphur, the Chickasaw National Recreation Area, the fifth largest casino in the world (along with 17 other casinos and gaming centers), theaters, golf courses, campgrounds and RV parks. While each of these attractions achieved modest annual attendance, there was no unified promotion of the region as a tourism destination to attract travelers. The tribe’s challenge was to create a compelling, recognizable identity and communication system that would help people understand the wide range of tourism possibilities in the Chickasaw Nation, and make them want to visit. The Chickasaw Nation selected the Wanderlust team to create a campaign to promote southern Oklahoma as an international tourist destination. The project included conducting market and consumer research, defining a unique brand position, designing an identity and developing an ongoing marketing communications strategy. Bill Anoatubby, Governor of the Chickasaw Nation, felt the project would benefit tourists, the tribe and the state. “Tourism is an important part of Oklahoma’s economy and we believe this campaign will provide tremendous economic benefits for the Chickasaw Nation and the state of Oklahoma.” It was clear that the Chickasaw had tourism attractions and a presence in the region. But there was no unifying theme or identity that helped create desire for the region, or would help individual locations cross-promote and share visitors to everyone’s gain. Wanderlust’s mission was to mark the territory, package the experience for prospective travelers, build awareness and help fill in the gaps that kept travelers from experiencing more than one or two of the territory’s many attractions. The line, “A million ways to play” refers to the region's many recreational opportunities, and the tribe’s pride in its growing list of tourism attractions. The graphic identity reflects the cultural aesthetic of the tribe, their lands, their arts and crafts. The communication strategy is built around the idea of “road trips;” short one- to three-day driving adventures that link multiple tourism assets throughout the Chickasaw Country. Imagery and messaging highlight the variety of recreational opportunities and natural beauty of the region, the tribe’s hospitality, and the excitement and authenticity of the experience. Windham Mountain, in New York’s Catskill Mountains, is one of the closest major ski resorts to the New York Metro population center. In recent decades, the resort's biggest challenge was that skiers and riders in their market thought of Vermont ski resorts first, Hunter Mountain (a close Catskill competitor) second, and Windham Mountain third. The resort lacked a clear brand position, its visual identity and campaign strategies meandering about without creating a unique or relevant point of differentiation for the mountain. While skier days (and overall revenue) showed Windham Mountain to be a strong player in the industry, management wanted to take the brand to a higher level. The new owners wanted an identity that would make them a destination ski resort rivaling Beaver Creek or Deer Valley. In doing so, they expected an increase in season pass sales, increased traffic to the Windham Mountain website and higher lodging occupancy. As part of a major $5 million capital improvement strategy, Windham Mountain hired Wanderlust to reposition the brand in a top-to-bottom overhaul of its identity, mass media creative, on-mountain signage, website and collateral. With the help of the Wanderlust team, Windham Mountain undertook a comprehensive analysis of new and existing market research data; consisting of skier surveys from around the region, one-on-one interviews with stakeholders, core customers and non-customers and secondary research from industry sources. Our findings helped us refine our target audience, skiing families with heads of household aged 35-54, most living in the New York metro and surrounding areas. Their incomes are high, their homes expensive and their zip codes exclusive. These consumers desire a family-oriented environment, tend to stay overnight and expect the creature comforts of an upscale lifestyle. They want ski terrain for all abilities, amenities for younger members of their group, the best snowmaking and grooming and a brand that understands why they ski (to be active with family and friends). An experience that Windham Mountain can deliver, on all accounts. The insights gleaned from our research helped Wanderlust identify opportunities to focus the brands position and make it more relevant, differentiated and desirable to this audience. Our insights helped us develop creative messages that departed from typical industry clichés. We desgined and tested a new corporate identity, the playful “W-skier” logo, that became an instantly recognizable visual icon. The creative platform introduced an updated color palette, a fresh photographic style and a light-hearted campaign theme that invited skiers and riders to “come out and play”. 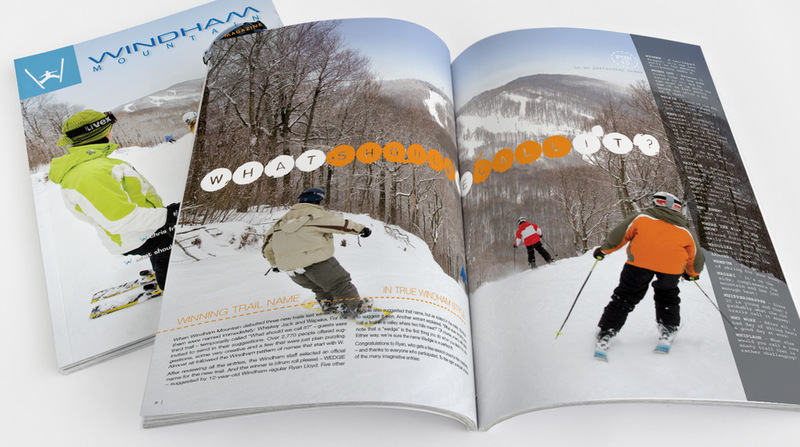 The repositioned Windham Mountain brand was rolled out in 2006/2007 through an integrated on and offline media campaign directed at our target audience. Campaign elements included on-mountain signage, trade and consumer print, outdoor and transit advertising, direct mail, banner ads and collateral. After an unusually warm early winter, which offered zero natural snowfall to inspire skiers, the inaugural season of Windham Mountain’s new brand was a resounding success. In a year that saw several Northeast ski resorts suffer decreases of more than 25% over prior years, Windham Mountain finished the 2006/2007 season with revenue close to their previous year and an increase in season pass sales. Web traffic at the Windham site surpassed even our expectations, with user sessions up 139%, page views up 227% and duration of visits up across the board. The resorts management recognized the branding’s success by investing another $4 million in facilities improvements for the 2008/2009 season. Howe Caverns is the largest show cave in the Northeastern US. It’s also a roadside attraction from a time gone by, when people drove out to the country to see what they could see. Today, Howe Caverns competes with flashy amusement parks, water parks, interactive video games and the bright lights of the shopping mall. Until recently, they promoted the tourism destination through geographic marketing, widely dispersed billboards and broadcast media in a limited area. Their online strategy included a web site, but no banner advertising, no search engine optimization and no behavioral retargeting. Howe Caverns relied on old school media to compete in a new school market. Annual visits peaked at nearly a quarter million per year, but had been declining steadily. The management decided it was time to take Howe Caverns to a new level. Purchased in 2007, the new owners committed significant capital investments for cavern expansion and the addition of several above-ground activities. They wanted to reinvent Howe Caverns as a year-round travel destination and enhance the user’s experience to attract new and repeat visitors. Howe Caverns hired the Wanderlust team to rebrand the destination and roll out a new media marketing campaign to increase annual visits. Working with their in-house team, Wanderlust initiated a comprehensive market research project to analyze the business, it’s brand equity and the opportunities for growth in the market. We conducted one-on-one interviews with stakeholders, employees, cavern visitors and non-customers. In addition, the team researched geographic markets, media opportunities and travel consumer behaviors. Our research showed that Howe Caverns visitors fall into two broad categories: day-trippers who live within 150 miles (an area that includes NYC metro, Northern New Jersey, Pennsylvania and Upstate New York), and vacationers who visit Howe Caverns as part of multi-day trip to the region. Demographics reveal that visitors span a broad spectrum, but the majority are families with young children. This research helped Wanderlust gain insight into our target audience’s decision making processes. It has been proven that travel consumers are greatly influenced by vivid sensory experiences, and rely on travel websites for the information they need to select destinations or plan trips. Imagery, verbal descriptions, story-telling and reviewer comments all contribute to their ability to imagine and anticipate the activities they will experience at a selected destination. We used these insights to realign the brand position and create core messaging for creative development. Based on our research and understanding of travel consumers’ purchase behaviors, the Wanderlust team recommended repositioning the brand from its current perception as “an old roadside attraction” to “a real cool way to spend the day”. We created a new identity for Howe Caverns. Youthful, energetic, gritty and alternating between light and dark, the visual identity conveys all the excitement, wonder and adventure of Howe Caverns, with an invitation to “go underground”. It is supported by dramatic photographs from the cavern, along with images of people engaged in the many activities available on the surface. We redesigned and enhanced the website and launched a new media creative campaign for transit and online advertising. We dramatized the underground experience, provided vivid descriptions of a trip inside the caverns, and employed online messaging and search engine functionality to get the message out to a young audience.